Sea creatures like fishes have evolved their shapes in a period of hundreds of millions of years to what they are today, an unimaginable kaleidoscope of form and function. By comparison, the human shape is not at all at home in the water. But it has its own qualities. It is me, it is you, it is versatile, it is soft and attractive to us. As we swim, we feel the stroking of the cool water over our entire body, and we like it. Nothing is more giddying than the specter of clear water as we feel a primitive desire to be in it, to cleanse ourselves with it. It is worth fighting for. For the photographer the naked human figure under water is a true challenge as revealing too much can spoil the intention of beauty in this blue liquid crystal. Catching the continuum of motion in a still image, is part of the challenge, as demonstrated in these images of underwater models. f023718: the plunge, epitome of freedom and sensuality. 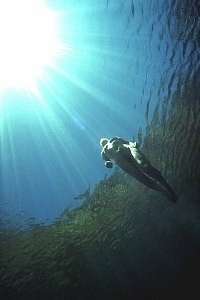 The swimmer plunges into cathedral light, but where the water's surface is disturbed, it creates a shadow. f023719: a bubble shroud envelops the free diver. She feels the bubbles stroking her skin and the rush of the water rippling it. f023422: Free ascent. 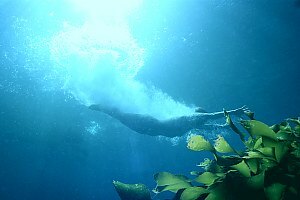 A naturalist swimmer leisurely makes her way to the surface where the water has restored the disturbance of her entry. f023730: The plunge. 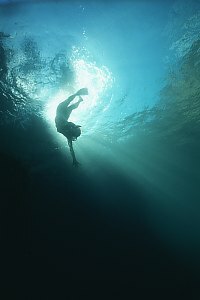 A scantily clad diver enters the crystal clear water of the cool sea. f023708: Free and unencumbered. 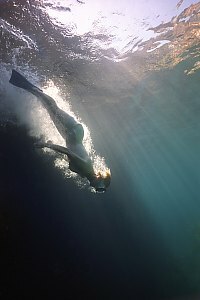 A model freediver slowly makes her way back to her starting point.